Adreian Payne scored a career-high 32 points and No. 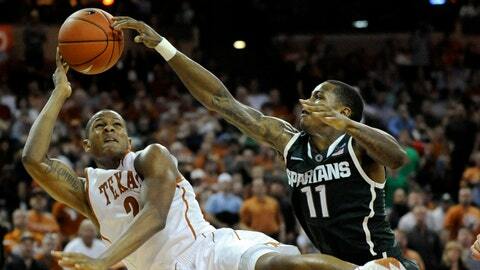 5 Michigan State dominated the final 11 minutes of a 92-78 victory over Texas on Saturday. The Spartans (10-1) led for only 56 seconds in the first half as Texas (10-2) controlled the game early. Michigan State used a 9-2 run to take a 52-50 lead about halfway through the second half. Following two quick buckets by Jonathan Holmes, six Spartans scored during a 14-2 run that put the game away. Payne made two free throws during that run and went 10 of 13 from the field and 11 of 12 from the free throw line. Gary Harris, who missed three recent games with an ankle injury, scored 19 points while Travis Trice, battling a foot blister, contributed 13 points and was 3 of 4 from 3-point range. Cameron Ridley scored 13 of his 17 points in the first half for Texas, which was coming off a win at No. 14 North Carolina. He was 7 of 10 from the free throw line but he attempted only two shots from the field in the second half. Texas had four players score in double figures for the 10th straight game as Isaiah Taylor had 16 points and five assists while Javan Felix and Holmes each added 11 points. Texas opened the game on an 8-2 run. The Spartans took their first lead of the game at 21-19 on a layup by Branden Dawson, who finished with 11 points and 10 rebounds. But the Longhorns quickly reclaimed the lead on two 3s by Damarcus Croaker. Felix hit a 15-footer in the final seconds of the first half to give Texas a 38-36 lead. His only 3-pointer of the game put the Longhorns on top 47-43 early in the second half but they never held that large of a lead again. Kendal Yancy of Texas hit a 3-pointer to tie the game at 50. Holmes gave Texas a 54-52 lead with a putback and a layup on consecutive possessions. Dawson answered with a layup that triggered the game-deciding run by Michigan State that the Longhorns were unable to recover from. The Spartans took their first double-digit lead with 7:26 remaining after two free throws by Payne on the way to their most lopsided win over Texas in school history.